Volume up from June 2017. On a total milk solids basis, U.S. exports were equivalent to 16.4 percent of U.S. milk production. 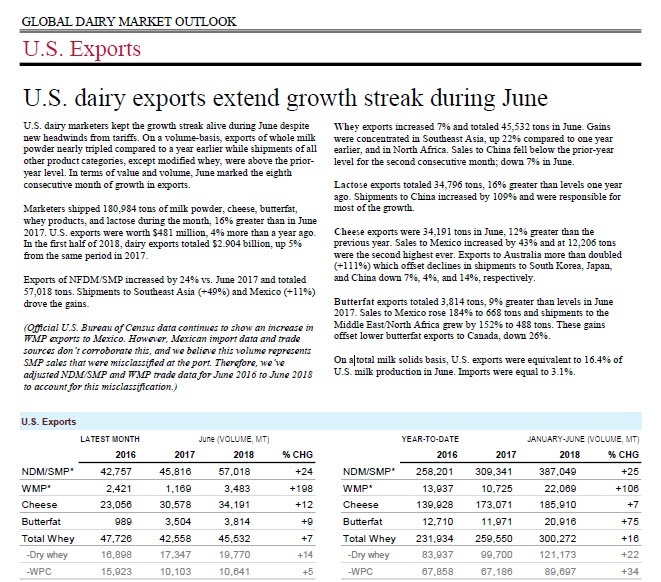 U.S. dairy marketers kept the growth streak alive during June despite new headwinds from tariffs. On a volume-basis, exports of whole milk powder nearly tripled compared to a year earlier while shipments of all other product categories, except modified whey, were above the prior-year level. In terms of value and volume, June marked the eighth consecutive month of growth in exports. Marketers shipped 180,984 tons of milk powder, cheese, butterfat, whey products, and lactose during the month, 16 percent greater than in June 2017. U.S. exports were worth $481 million, 4 percent more than a year ago. In the first half of 2018, dairy exports totaled $2.904 billion, up 5 percent from the same period in 2017. Exports of NFDM/SMP increased by 24 percent vs. June 2017 and totaled 57,018 tons. Shipments to Southeast Asia (+49 percent) and Mexico (+11 percent) drove the gains. Whey exports increased 7 percent and totaled 45,532 tons in June. Gains were concentrated in Southeast Asia, up 22 percent compared to one year earlier, and in North Africa. Sales to China fell below the prior-year level for the second consecutive month; down 7 percent in June. Lactose exports totaled 34,796 tons, 16 percent greater than levels one year ago. Shipments to China increased by 109 percent and were responsible for most of the growth. Cheese exports were 34,191 tons in June, 12 percent greater than the previous year. Sales to Mexico increased by 43 percent and at 12,206 tons were the second highest ever. Exports to Australia more than doubled (+111 percent) which offset declines in shipments to South Korea, Japan, and China down 7 percent, 4 percent, and 14 percent, respectively. Butterfat exports totaled 3,814 tons, 9 percent greater than levels in June 2017. Sales to Mexico rose 184 percent to 668 tons and shipments to the Middle East/North Africa grew by 152 percent to 488 tons. These gains offset lower butterfat exports to Canada, down 26 percent. On a total milk solids basis, U.S. exports were equivalent to 16.4 percent of U.S. milk production in June. Imports were equal to 3.1 percent. For more detailed trade data accompanied by tables and charts, download USDEC’s three-page (PDF) document below. To use interactive charts with current and historical trade data, see usdec.org's page on U.S. export data. Marc Beck is Middle East/North Africa business unit director for the U.S. Dairy Export Council. The U.S. Dairy Export Council fosters collaborative industry partnerships with processors, trading companies and others to enhance global demand for U.S. dairy products and ingredients. USDEC is primarily supported by Dairy Management Inc. through the dairy farmer checkoff. How to republish this post.